Lamar University is pleased to announce the grand opening of its Student Service Center in McAllen. Designed to serve anyone considering enrolling in college, from graduating high school students through working adults, the center welcomes Valley residents to learn about higher education opportunities in-person, directly from experts. “We are truly excited about serving the Rio Grande Valley through the face-to-face services available in our new student center,” said LU President, Dr. Kenneth Evans. "We feel that providing a convenient location where prospective students can speak with our bilingual advisors, get their admission questions answered by specialists and discover the right degree program for them is an innovative step toward more student-centered higher education. 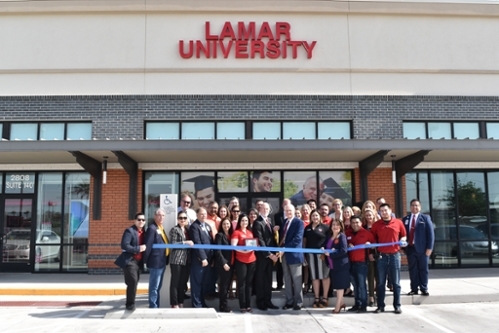 The Lamar University Student Service Center is now open for business in the Shops at 29, 2802 West Expressway 83, in McAllen. The public is invited to visit and also to join in the Grand Opening celebration. The ribbon cutting ceremony will take place on Thurs., April 11 at 10:30 a.m. and Grand Opening festivities will be on Fri., April 12, from 4 to 6 p.m. This all-ages event features a live radio remote by KBFM “Wild 104” as well as food, giveaways—and more! As a nationally ranked University, LU currently offers more than 100 programs of study, with the Student Service Center emphasizing on-campus and online bachelor’s completion programs in business administration, communications, nursing, criminal justice and more, as well as graduate degrees in business, education and nursing. Online programs offer the flexibility of multiple class start dates and the convenience of paying by the course. “Over our more than 90 years as a university, we have dedicated ourselves to student success. The programs we are offering, as well as the friendly support available from our knowledgeable staff at the center, are specifically designed to help students find the right degree for them and to graduate,” Evans said. The Lamar University Student Service Center is open Monday through Wednesday from 9 a.m. to 7 p.m., Thursday from 10 a.m. to 8 p.m., Friday from 9 a.m. to 6 p.m. and Saturday from 10 a.m. to 2 p.m. The Center is closed on Sunday. All education consultation services are offered free of charge by appointment or via walk-in visits during business hours. More information is available by visiting the center at 2808 West Expressway, Suite 120, McAllen, TX 78501 or by calling 956-616-4000. For more than 90 years, Lamar University has provided high-quality education focused on student success. A member of The Texas State University System, the LU home campus is located about 90 miles east of Houston in Beaumont and serves 15,000+ students with more than 100 accredited programs of study leading to bachelor’s, master’s and doctoral degrees. LU is a recognized leader in online education, with many programs nationally recognized.